Break open the patchouli oil, dust off the tasseled macramé half-shirts, and pack up the VW Bus, because the Grateful Dead has added two additional dates to its Fare Thee Well 50th anniversary farewell/comeback tour. 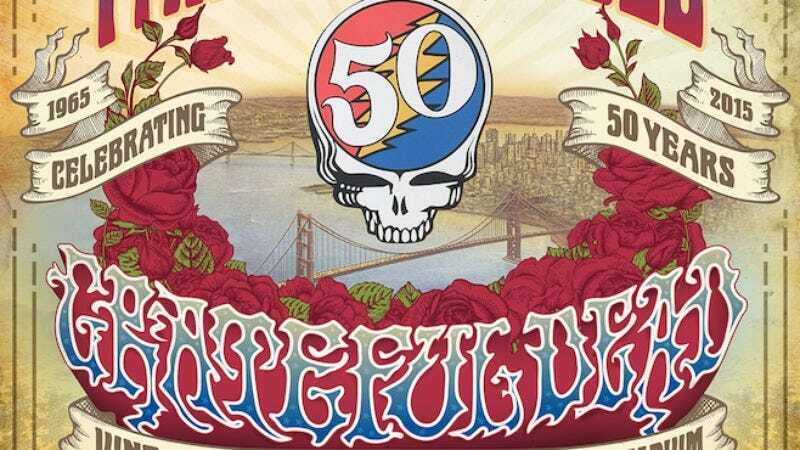 In addition to three shows at Chicago’s Soldier Field on July 3-5, the Dead is taking its act an hour south of San Francisco—where it all began—to Levi’s Stadium in Santa Clara, California on June 27th and 28th. While frontman Jerry Garcia is still very much 20 years departed from this earth and thus won’t be able to make it, official Grateful Dead members Mickey Hart, Bill Kreutzmann, Phil Lesh, and Bob Weir will be present, along with keyboardist Bruce Hornsby and Phish’s Trey Anastasio. In a letter on its website, the band explained the reasoning behind tacking on the additional shows, saying, “Since we made the decision to go back to Chicago to say our final goodbye, it has become clear to us that we first need to return to our beginnings, where we first said hello—to each other and to all of you.” The letter continues, “We have decided to plug in for two additional shows on June 27 and 28 at Levi’s Stadium in Santa Clara, California—just a dozen miles south of where Dana Morgan’s Music Store once stood.” The aforementioned music store was the site of some of the Dead’s first concerts. For more information visit dead50.net.